A car built in Scotland is being used in another attempt at the world record for minimum fuel consumption. The BOC Gh2ost, being tested in Shetland, is powered by hydrogen and its only emission is water. The car weighs under 40kg, meaning only a very small driver can use the Gh2ost, but it is hoped the technology could become widespread within 20 years. The first attempt at the 10,075 miles per gallon record last August managed to eke out 1,200 miles from a gallon. John Carolin, BOC's global director for hydrogen energy, said: "It sounds unbelievable how little power is used to keep the BOC Gh2ost moving, but it demonstrates the impact of careful design and is a valuable lesson for car makers in the future. "Hydrogen power could create a pollution and noise free environment and bring vital transport solutions to people in poorer parts of the world, which is why this research is so important." The 25 watt Gh2ost car will attempt to break the record during the Shell Eco Marathon at the Grampian Transport Museum in Alford, Aberdeenshire. Aberdeen-based company siGEN is managing the project and supplying the fuel cell technology that enables the car to run on hydrogen. The car's dolphin-like body shape has been crafted by racing car designer Hugo Spowers using carbon fibre and lightweight aluminium. 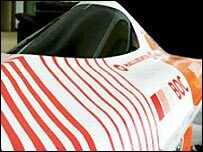 Shetland Composites built the body using Formula 1 composite carbon fibre technology.